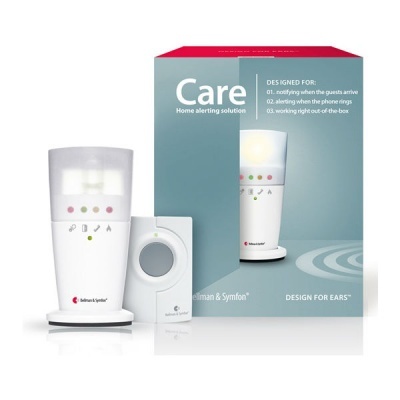 The Bellman Care Alert System emits a flashing beacon light to indicate incoming telephone calls or activated doorbells. This will be an ideal set for anybody with hearing difficulties who worries about missing visitors or important calls. How Does the Care Alert System Work? The Care Alert System can be easily connected to a telephone with the cables provided, and it will then flash with a bright beacon whenever the phone rings. If you often struggle to hear the phone ringing, this can provide a visual indicator to help you ensure you never miss an important call. For supporting doorbell activation, the Care Alert System can also be wirelessly connected to a doorbell to provide a suitable indication for when visitors have arrived and pushed the doorbell. This will allow you to go about your day more freely without worrying about not being able to detect when somebody has arrived. Who Can Benefit from the Care Alert System? Primarily designed for anybody with hearing difficulties, the Care Alert System will greatly benefit those who wish to reduce the risk of missing calls or guests. Always feeling like you need to keep your eye on the door or telephone can become quite stressful, so this will help to eliminate the need to always keep your attention fixed on one location. The Care Alert System will also be useful for family and friends who wish to have peace of mind that their loved ones can be more easily reached. By enabling a more practical visual indicator to attract their attention, the system can reassure friends and family that they will be able to reach their loved ones without their calling going unnoticed.